Round Barn Farm began the adventure of raising American Jacob Sheep in the summer of 2011. We spent many months doing extensive research about sheep breeds, even before we bought our farm. We did much reading, visited many sheep farms that raised various breeds of sheep, and met many wonderful people along the way. Why did we choose Jacobs? First of all, they are beautiful, with their very individual spotting patterns and unique and stately horns. We love their wool, as well; it was the wool I learned to spin on, and I love it's versatility and beauty. 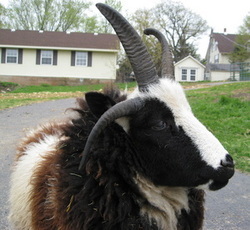 We also appreciate the reputation of the Jacobs as being a hardy breed, resistant to many diseases that plague modern breeds of sheep. The Jacobs, a primitive sheep, are noted as easy lambers and excellent mothers. Though sheep suffer from a stereotype of being, well, less than intelligent, we are impressed with the fact that Jacobs, because they are a primitive breed, seem to be smarter than many commercial breeds. Several of the Jacob breeders we talked with when making our decision stressed how Jacobs can fit into a busy lifestyle. We have learned that this is true! We also learned that the American Jacob sheep are listed by the American Livestock Breeds Conservancy as a "threatened" breed. So we felt we would be doing something good to help preserve these lovely spotted and many-horned sheep. Our sheep have changed our life, quite literally. We love caring for them day by day, getting to know their individual personalities, and spending time with them in the pasture as they graze. In our small way, we are seeking to preserve this beautiful, hardy breed of sheep, while providing our customers with quality breeding stock, wool and wool products, and meat lambs.